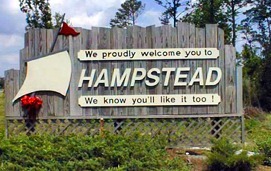 An up and coming residential area, Hampstead has what you are looking for. Located off of US Highway 17 and conveniently between both Wilmington and Jacksonville, the Hampstead area would be a perfect fit for any person looking for a home that makes commutes easier. Hampstead is also home to the NC Spot Festival, a yearly non-profit festival that brings in seafood lovers to celebrate Hampstead's popular fish, the spot fish. All proceeds from this festival go towards Hampstead's fire department and the five Topsail schools in the Pender County school system. Not only are you filling your belly at this festival, but you are also giving back to the community. Don't let the fact that Hampstead is an unincorporated community in Pender County fool you. Hampstead is becoming a hot spot for home buyers as it continues to build and add on to the neighborhood with new stores and restaurants alike. Hampstead, NC is our specialty. Our team can help you with a pleasant buying and selling real estate experience in Hampstead. Our website is uploaded with instant data directly from the mls which allows you to search homes for sale, townhouses, condos, land, and investment property. You'll find our website easy to use. You can save your searches and get daily email alerts when something new comes on the market that meets your criteria. If you are looking for real estate in 28443 this neighborhood would be a prime location for buying your future home. If you would like more information on any of these Hampstead homes for sale, please feel free to contact us by clicking the button below or go ahead and take the next step by clicking "Schedule a Showing" after clicking on any of the houses you are interested in. We can provide you with more information, like past sales history, neighborhood amenities, and area information.